We planned to go on holiday Monday last week, but Paul's shoulder specialist booked a neck MR scan for Paul on Wednesday so we had to delay. Then Paul got called in for a work meeting on the Thursday morning so we delayed again and by the time he got back from that, we were both too tired to head off so we delayed once more. 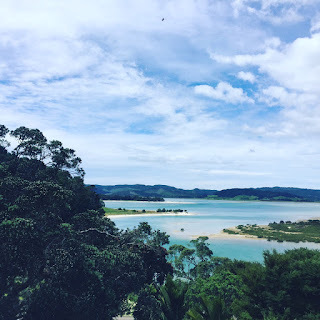 On Friday afternoon we finally managed to set off on our family holiday - the one we were meant to have been on for the last month already (until shoulder pain intervened). ...to various spots around my garden. My garden is well mulched now. 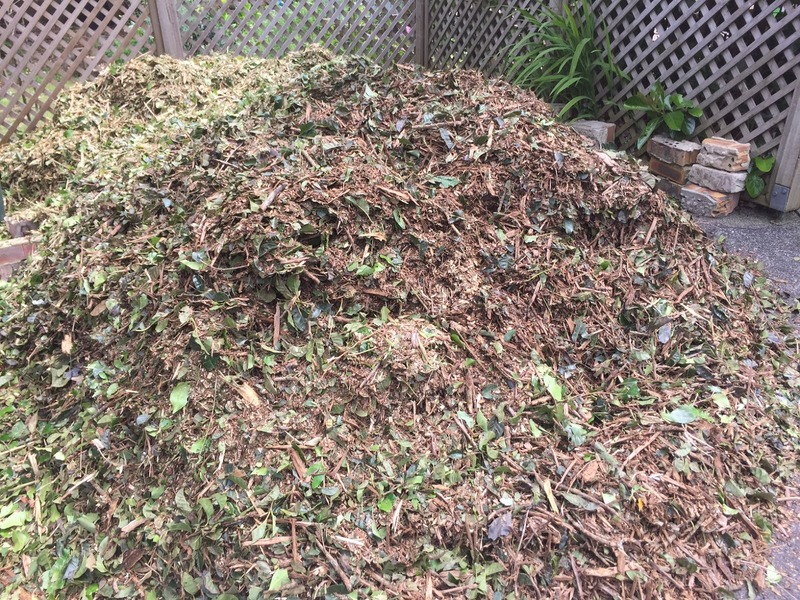 Paul asked if there's such a thing as too much mulch, looking around our over-piled gardens. Never. I told him. It breaks down fast so that what looks like a huge pile reduces to a thin layer in no time. I'm happy with our current mulch levels. 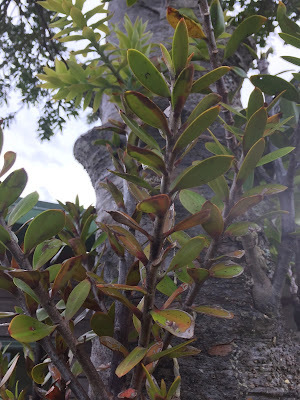 And I was careful to keep it away from the trunks of my trees so it doesn't cook them. The extra days at home also gave me time to finish painting the bottom story of our house. I finished the back of the house after dark the night before we left for our holiday. I'll definitely need to go back and touch that up at some point, but I got two layers on there at least so it's looking pretty decent. 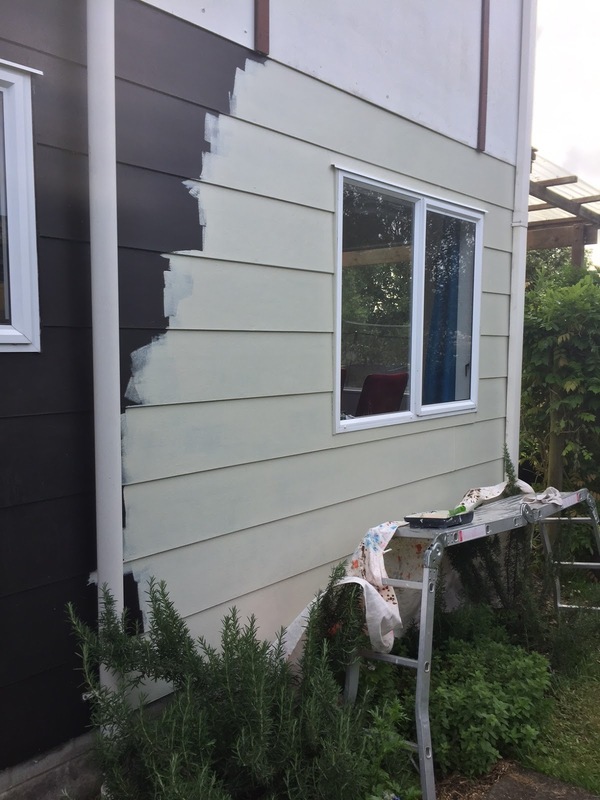 Our house cladding is fibre cement so I didn't have to sand the walls first which saved a lot of time. We also have aluminium windows, so I didn't have to paint them either. Overall this painting job was a lot quicker than I was expecting. I was so tired after shoveling mulch and painting the house that I limped into bed each night. Paul heated up our wheat pack for me, but I had trouble deciding which muscle needed it the most. In the end I just shifted it around from spot to spot, sharing the love. Heating up a wheat pack is the main reason we still have a microwave. I was really glad to get the painting and mulch-moving done before we left for our holiday. I hate leaving things unfinished. The frugal nature of those two jobs was that: the mulch was free and will help build up organic matter in my garden while suppressing weeds and retaining moisture in the soil that feeds all our fruit trees; the paint cost a couple of hundred dollars but I did all the work myself so I saved $$$ on labour costs. Going back to the start of last week, we celebrated Guy Fawkes at our friends' house with a potluck dinner in their backyard next to a roaring brazier. I donated scrap wood from my yard for the brazier, which excited me because I'm trying to clear out all the wood left over from building our raised gardens. It's still sitting in a pile next to our garden shed, looking messy and annoying me every time I glance its way. For the potluck dinner I contributed roast chicken and a large jar of stewed apples I'd made back when I got a box of free apples. We turned the stewed apples into crumble, which everyone loved. 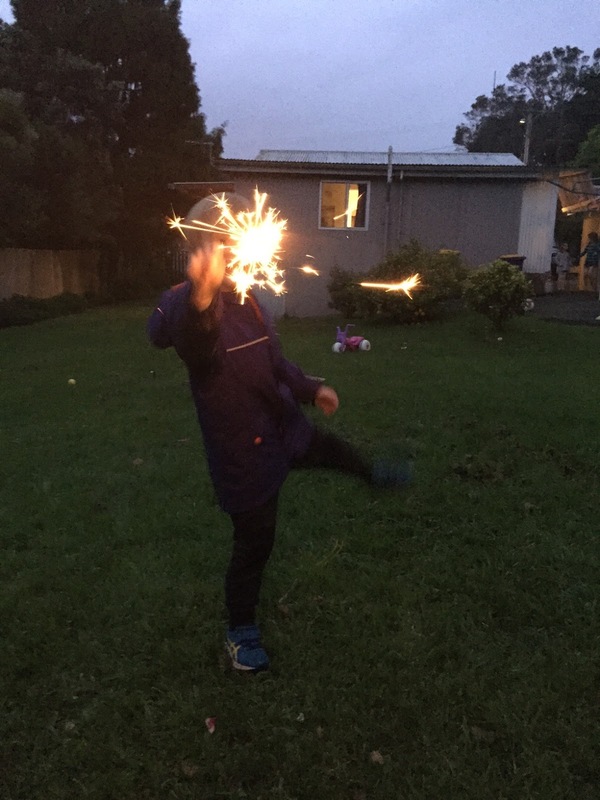 We bought fireworks for the night and they weren't cheap but it was worth it because it was one of those experiences I'm sure the children will remember their whole lives. I certainly remember the fireworks from my childhood. 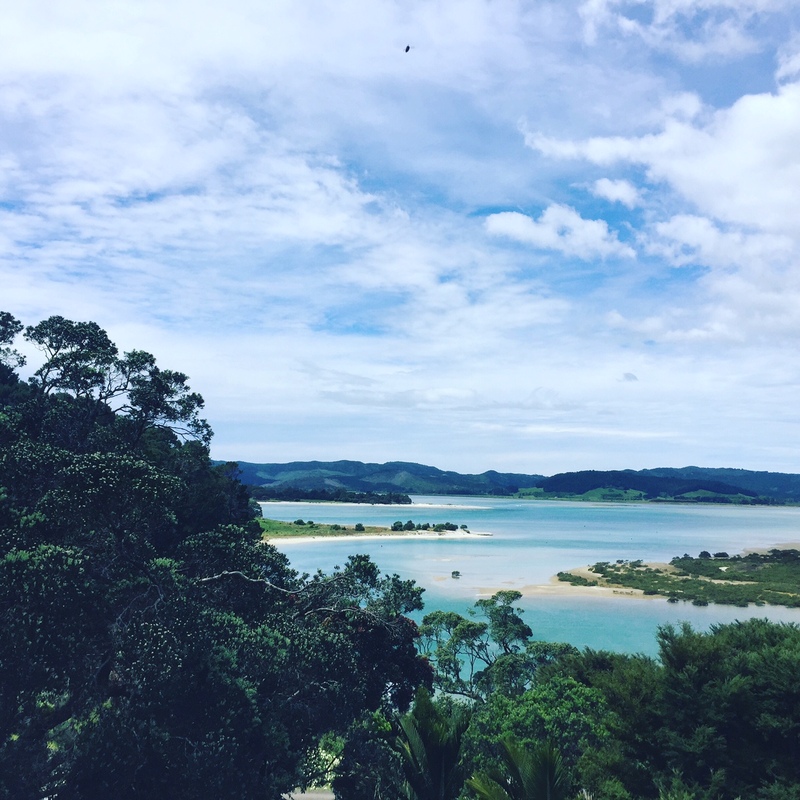 I caught up with a couple of homeschooling Mums last week to get their curriculum advice. One of the Mums mentioned she and her son often whip up hummus at home and I got inspired to make some too. I had been feeling really flat and thought hummus and fresh vegetables might just give me the boost I needed. It did. The great thing about the hummus was that I already had most of the ingredients in the freezer. I had bought a big bag of dry chickpeas earlier in the year and cooked then frozen all the chickpeas in one-cup portions. I used one of those portions for the hummus, along with roast capsicum I had bought on special earlier in the year and roasted and frozen. I didn't have any lemons and the hummus recipe called for lemon juice, so I scrounged around in my freezer and managed to find one ice-cube of lemon juice that I had juiced and frozen when someone gave me a bag of lemons. Most of the cubes had got used up for lemon honey drinks when we had winter colds, but luckily for me there was one cube left so I threw that into the mix. The recipe called for tahini, which I didn't have, so I substituted a mixture of olive oil and sesame oil. A clove of garlic, a bit of salt and pepper, twenty seconds in the Thermomix and we were in business. 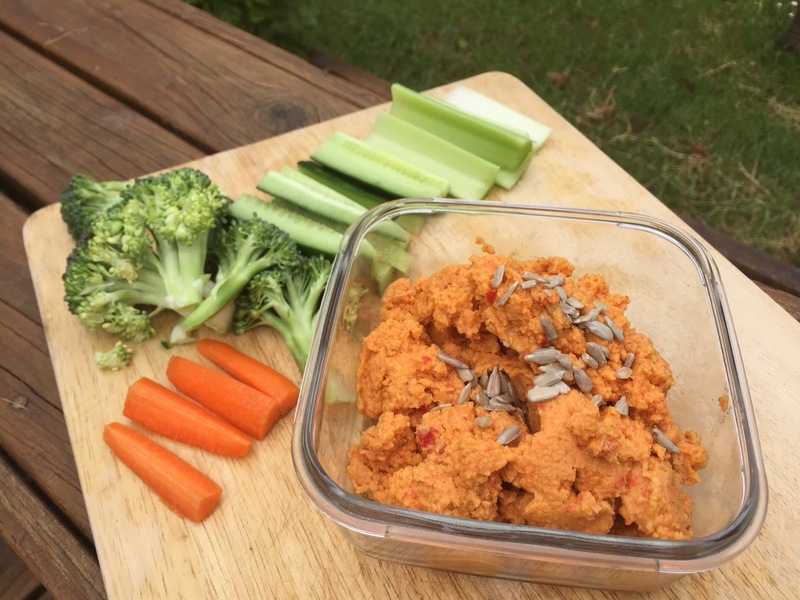 Fresh roast capsicum hummus, completely vegan, refreshing and cheap. 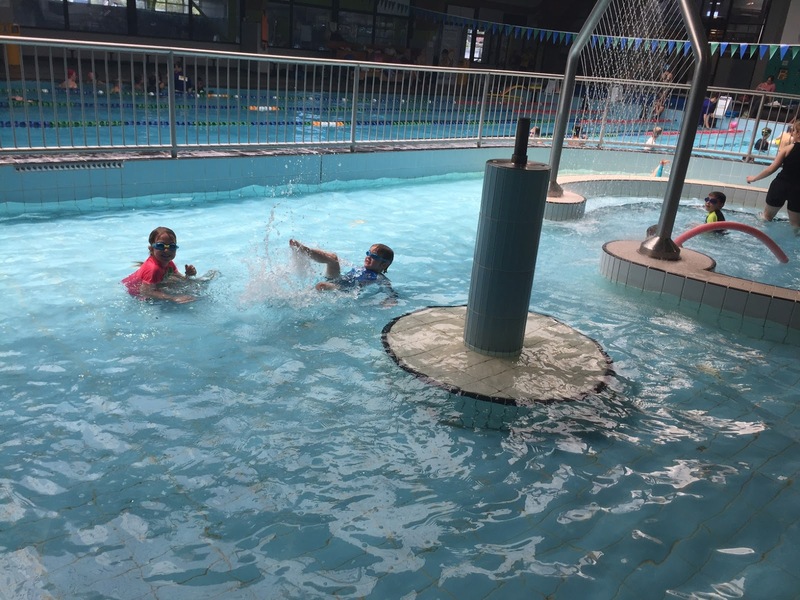 I caught up with the second homeschooling Mum at a swimming pool where her kids were having their weekly lessons. 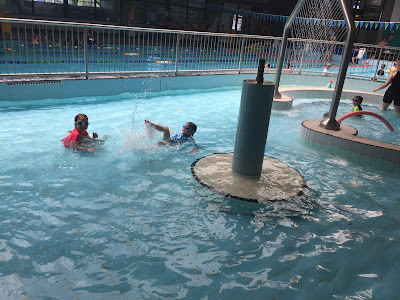 It only cost $1 for my children to gain admission to the pool too, and I just sat on the side and watched them play together while I discussed curriculum ideas with my friend. It was a lovely afternoon for everyone. I so appreciated having L there to swim with J and keep him entertained. She took her big sister duties seriously, but I was just a few steps away if anyone ran into trouble, which they didn't. I've started a new assignment for the Certificate of Horticulture I'm doing free through the Open Polytechnic. This assignment involves studying trees, shrubs and climbers, so I've been wandering around taking clippings and pressing them. I got my last assignment back in the mail just before we left for our holiday and I passed (yippee!) so now I've only got five assignments to complete before I've finished the entire course. 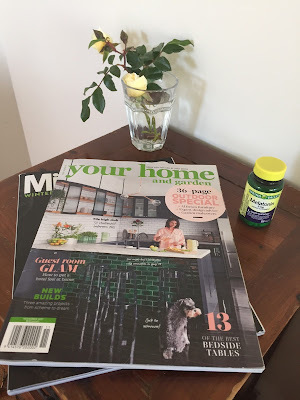 When Paul went to the US in September, I asked him to buy Melatonin because he hadn't been sleeping well and several of our friends had recommended it. You can get Melatonin over the counter in the US (I think Paul managed to find it at Walmart) and it's really cheap. For some reason you have to get it prescribed by a doctor here in New Zealand, which seems overkill to me. Paul bought the Melatonin but hasn't been taking it so I decided to try it instead. I've always been a terrible sleeper and already I'm finding the Melatonin to be so helpful. It's the hormone your body naturally produces as the sun sets to help you wind down for sleep, but I think we interrupt that process with artificial lighting and gadgets. Taking a tablet of Melatonin is like triggering my body to sleep. It's way better than a sleeping tablet, which wipes me out in a different way. I can still wake with the Melatonin if I need to, but it's heaps easier to get back to sleep again if I do. I'm in love. Here's that photo of my side table again so you can admire the wild roses my children picked for me this afternoon. Aren't they darling? There's also a couple of magazines on there - one I got for free from SISTAS conference and one I bought for this holiday as a little treat to myself. I love Your Home and Garden magazine and have been blessed to read lots of them lately in medical waiting rooms as I've waited for Paul's shoulder appointments. I really ummed and ahhed about buying this particular magazine though. It cost around $8 and that seemed like such a splurge for a magazine, but then I thought about all the free copies I've read lately and decided this could be my way of supporting a magazine I love. I read it cover to cover the first night we got here and relished every minute of it. Now I'm going to leave it at the bach for my sister-in-law, who also loves home design magazines. In good news, Paul's shoulder is mostly pain-free now. He does have nerve damage which means he has muscle weakness in his left arm, but he's up and about and off his pain medication. It's so good to have him back in action. As I type this he's washing the dinner dishes, and earlier today he took the kids to the beach while I chillaxed. We couldn't have dreamed of him doing those things three weeks ago. Hurray for mobility. This post seems to be really long today, but I keep thinking of more things to say. For those of you who are still with me, tonight I cooked Asian Mince on Rice for dinner, and made a double batch of rice so I can cook Chinese Fried Rice for another dinner this week. I also cooked the rice in homemade chicken stock I brought from home to add flavour and nutritional depth, which is something I've done for years now. I just throw the frozen chicken stock into the rice cooker with some water and the rice and let it thaw on the Warm setting. It gives the rice time to soak before cooking, which is also good for digestibility so it's win/win. I watched a whole lot of freezer cooking YouTube videos today and I'm thinking the Asian Mince on Rice would be a good candidate for prepping and freezing. I'll do a blog post about that when I do it so I can let you know whether it works or not. The first night I cooked here at the bach, I made a roast chicken and saved the leftover meat for future meals just like I recommend in this week's $70 menu plan. I also saved the bones and have been saving all my vegetable scraps this week so I can make a big pot of chicken stock while we're here. Yes, I even make chicken stock on holiday. It's so good as a soup base and helps stretch whatever other provisions we've brought with us. 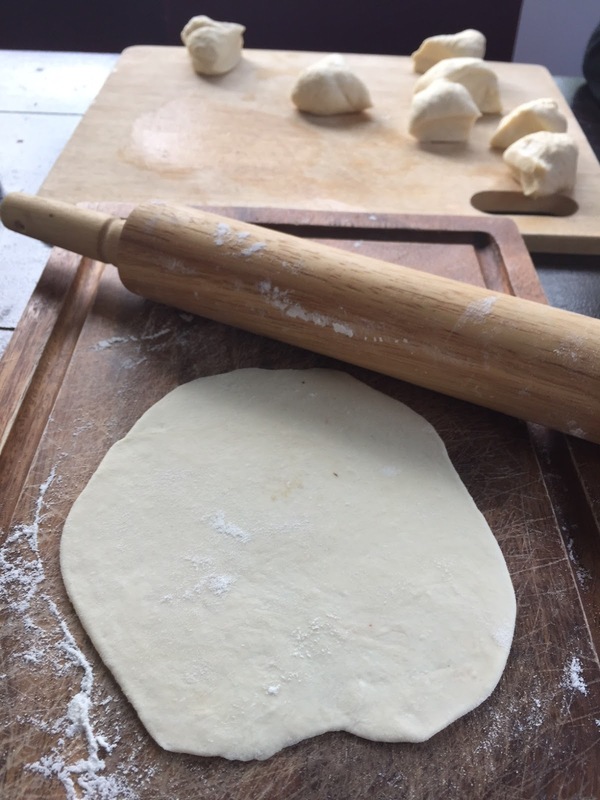 I also brought flour and oil on holiday with us so I can make tortillas. We made them last week and the whole family loved them. They were much simpler than I remembered. It had been a while since I had made them. One of my favourite things to do on holiday is to walk from one end of the beach to the other and back. The beach is 1.5km long, so the total walk is 3km. The last two days I've gone with my daughter, S, and it's been really lovely having one-on-one time with her. Since S is still at school and L is homeschooling, I've been feeling like S is missing out on family time. I know school is the right place for her at the moment, so I'm not tempted to take her out (yet), but it certainly is nice to spend time with her while we're on holiday together. In other family news, the girls both really love the board game Dominion. We've been playing a couple of games each day while on holiday and it's been so fun. Paul brought the Adventure extension set back from his last America trip and we've been loving the way that changes the game. (We already had Prosperity and Seaside for those who know what I'm talking about). Dominion is a bit above J's attention span at this point, so he either runs around playing imaginary games while we game it out, or he sits and builds stuff with his Lego. He doesn't seem bothered by the fact everyone's playing without him, thank goodness. And I think that might be all my frugal news for the past week and a bit. Now it's your turn. Share your frugal fun in the comments below or on Facebook so I can be inspired by you.